The French presidential campaign is kicking into high gear, and Nicolas Sarkozy has one key message for his ungrateful people: vote him back in, and he promises to spend his second term standing on the beach, like a magnificant granite Colossus, liquifying overseas demons with the sheer power of his blue-eyed gaze. Don’t believe it? Here’s the advert. It’s been running for about a month, and it’s the subject of some witty (and goofy) send-ups(Franc Fort, Farce Fort, France Morte…). But as I’ve just come across it, what in the dickens is it trying to tell us? He certainly doesn’t look prepared for the beach. First off, we ask ourselves – what exactly is this inexpressive poker face meant to project to us? That he doesn’t enjoy his job anymore? Or he has no time for trivial things such as cuddling kittens or chilling with his family? Perhaps it’s that compassion and empathy are naive, wasteful, hopeless attributes in a world strewn with threatening vagrants? I think so. Here is Sarkozy, steely-eyed warrior, who has achieved a lasting peace with his unenviable duty – the perennial defence of his people against relentless, unspoken nastiness, washing up on the nation’s beaches! Indeed, beaches. France is a famously geographically diverse country, and his deadened gaze might have been set against any number of natural backdrops. The Alps. A sun-kissed pasture. A mostly-sunny sky with a couple of attractive, clumpy clouds you just want to bite into. But this vast, flat grey sea. No sign of waves, islets, boats, or features of any kind. The eye is drawn to nothing but the horizon. And what lies over France’s oceanic horizons? Firstly, amongst the Marine Le Pen fans and other xenophobes of the far right (of whom there are too many), nothing matters more than immigration and foreigners. Take heart, hard-asses – when Granite-Sarko stands on his Mediterranean coastline, he looks outward towards North Africa with a sober resolve to smite so much as a dodgy looking raft drifting his way. Sure, Granite-Sarko seems cold, but it is because he fully understands the scale of the threat bursting northward from Algeria, Tunisia, Morocco, Mordor itself, overflowing with writhing masses of non-Christian refugees and non-conformist asylum seekers keen to exploit the nourishing teat that is the French Republic. Sarko stands on guard. France’s teat is not for their suckling. Plain and simple. For the more moderate French nationalists (of whom there are also a great, great many), Granite-Sarko stands not on the Med, and not so much as a merciless bulwark. But he stands on his northern shores, almost within sight of Great Britain, which he regards with the non-plussed demeanour of a dinner host watching an arrogant, drunken guest boast about himself while ladling brown gravy onto his salmon. With a dessert spoon. Sarko reminds his people, that in the face of Britain’s swaggering self-exceptionalism within the European Union, it is only he who can tell David Cameron, literally, to shut up. Sarkozy will not bend or wither, and will happily dismiss the selfish pleadings of his Anglo-Saxon nemesis and snub his handshakes! The logic is that London has tried for too long to free itself from Europe’s grasp, yet continues to enjoy coming down to the Continent with wagging fingers and half-assed condescension. Sarko responds by unfurling his middle finger, to the applause of his peeps. In that vein, he is self-respect, he is firmness, he is bold and fair on the European project, and will take no guff from ale-swilling islanders to the north. This poster, truly, has it all! Nicolas Sarkozy as the great Janus of French conservatism, looking two ways at once to two quite distinct voting constituencies and hoping, dearly, that at least someone, somewhere, in some direction, will take the bait. I’m beginning to build a distinct impression of David Cameron – especially when seeing him abroad. It’s a vision of a kind of self-playing bagpipe, one which honks and hums from one note to the next with no apparent effort to achieve coherence, grace or melody. Sorry, bagpipes. He communicates with a Blairesque (or even “Obaman”) self-confidence, but without the gravity of substance, the thrill of compelling argument, or the ring of sincerity. The end goal seems to be no greater than “conclude an effective schmooze” with whoever is hosting – even if that means infuriating other parties who aren’t physically present. It seems true of his visit to Turkey this week. I’m including some choice excerpts from his speech to the Turkish Parliament today (sub-headings by me). Thanks, David. I’m sure that the Turkish Parliament (which, umm, operates within a secular constitution) appreciates your view that Islam isn’t (just) for monsters. Hopefully in future, we should be so lucky as to have the UK or Canadian Parliaments told by a foreign leader that Christians are not inherently spiritless hypocrites. Because that’s just plain wrong. And that’s the point – presenting vague “opposite scenarios” isn’t really an insight – it’s fluff. Of course Turkey joining the EU would strengthen it in some areas, weaken it in others, anger the consolidating Hadrians and delight the expansionist Trajans. Cameron could have explained his idea as to what would be strengthened, why we’d be more prosperous, and how we’d be any more secure. Ambitious, I know. Does it? Because there are steps that a constructive member of the European Union could take to ensure that it maximises its influence, and they aren’t the steps Britain has taken. We know what Britain generally (and especially the Tories) wants the EU to look like – they pursue the broadest, shallowest version of Europe possible. A Europe that ought to keep spreading out to Ukraine and Turkey (even some liberals would like to include ceremonial semi-states like Kosovo), but the UK generally also idealises a Europe that does nothing, makes no laws, bears no arms, waves no flag. Kind of a big house party where everyone’s invited, and no one has any responsibilities. But the Conservative British desire for a big, flat useless Europe has manifested itself, unhelpfully, in British retrenchment from Europe. 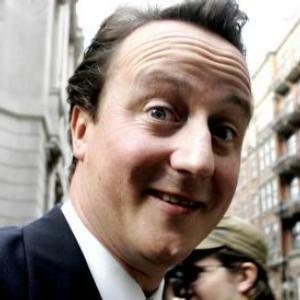 Cameron’s sidelined the UK in the EU Parliament by joining a bloc of nutters and nationalists. He campaigned on an anti-Europe ticket, and upon election, told the faithful he’d soon be wresting powers away from Brussels as soon as he could figure out how to. None of these policies have given the British any more influence in shaping Europe to their Trajanist vision, and so any “anger” now at Europe not behaving in UK interests is just misplaced. In short, if Britain were at the heart of Europe, maybe Turkey would be closer as well. Britain isn’t at the “top table,” and are unlikely to return there by stamping on Sarkozy’s or Merkel’s toes like this. Well, excitingly, Cameron will be delving deeper into Old Asia next, with a visit to India. Let us hope he doesn’t tell them their religion isn’t as godless as some make out, and that they’d make a smashing partner in the European Union too, if only the damned French weren’t so difficult about it. The French President is in London to commemorate the 70th anniversary of what is generally considered the beginning of the French Resistance. Immediately following the Nazi takeover of the French levers of power, and the collaborative accord signed by Pétain, General Charles De Gaulle escaped to London from where he would try to lead a French resistance in absentia. On 18 June 1940, he arrived at BBC headquarters to deliver a rousing speech aimed at compatriots back home, urging them not to give up the fight against their new Nazi occupiers and the Vichy Regime that accommodated them. It was stirring oratory, as it needed to be – especially as he was physically absent from his devotees back home. “Has the last word been said? Must hope disappear? Is defeat final? No! It is impassioned stuff, though there will always be some irony in invoking the “use” of the Allies’ great Empires in the war, as if there weren’t a hint of any moral quandary about the establishment of those empires themselves, nor any resistance within Allies’ colonies in aim of their own national liberations. And of course, De Gaulle’s taking for granted the Americans’ seemingly infinite industrial resources did come at its own price: eternal reminders of the fact. Whatever the importance of the occasion 70 years ago, it’s not certain how widely the radio broadcast was picked up back home in l’hexagone. At least, though, it did signal that we’d entered a brief period of two Frances: the official France under the Vichy, and the resistant France in its form as a scattered underground. P.S. EU Commission head José Manuel Barroso said a couple of days ago, possibly referencing the anniversary of the De Gaulle speech as much as he was referencing big decisions around the Greek bailout, that Europe comes together best during moments of crisis. Tell it to the ash cloud! But if a new cooperative spirit can be ressurrected in remembering Europe at its worst, well, that might be nice.